Places to see during the Summer Mykonos: villages, museums, shopping. Places to see during a Summer Mykonos: villages, museums, shopping. The main place where you will spend most of your time and of your days. In the central streets, restaurants, sparkling jewelers and boutiques await you. And, of course, the many trendy clubs and haunts of the people of Mykonos night, always awake. 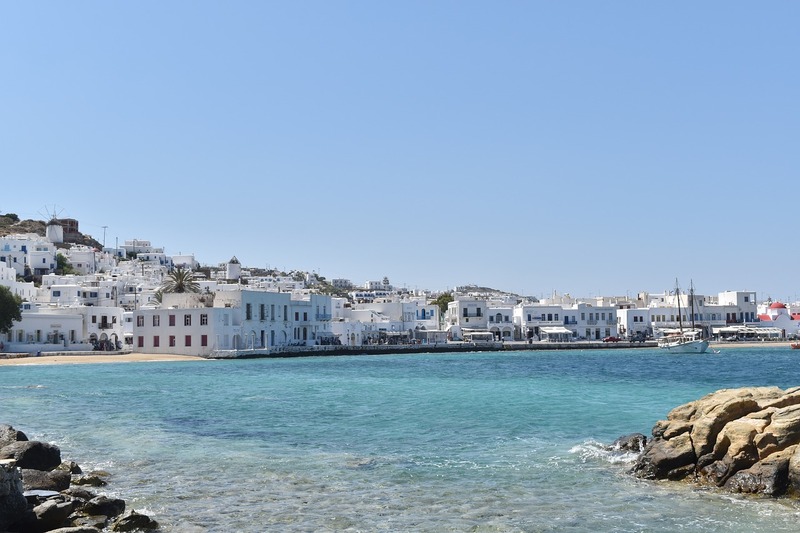 But it is leaving the busier streets, which you can discover the other less commercial soul of Mykonos. Narrow alleys, hidden corners, Cycladic architecture and whitewashed houses that contrast with the blue of the windows, and the beautiful balconies all flowered. A truly magical place! Limani is the beautiful area of ​​the marina, full of cafes and restaurants, and the houses clearly visible, arranged almost as an amphitheater. Ideal for a walk after dinner, with the colorful fishing boats and the lights reflected in the sea. Waters mirrored by Agios Nikolaos, protector of sailors. At the end of the port is the district of the Kastro, place where there was an ancient castle of which there are only some remains. Here is the church of Panagia Paraportiani, the oldest of the island. One of the symbolic places of Mykonos, super photographed, with postcard sunsets! In reality, it is a conglomeration of five ancient churches, built over the years, one next to the other. The fifth, and last, was built, instead, in a position above the others, so that today, Panagia Paraportiani is spread over two levels. Behind the port, you can stroll through narrow streets, between small chapels and two-storey houses, strictly white. Matogianni ed Odos Andronikou, are main streets crowded with cafes, restaurants, clubs, boutiques, jewelers, craft places. Ready for shopping? For a cultural break, during the Summer Mykonos, in Tria Pigadia is the Aegean Maritime Museum. Objects and relics related to the Aegean seafaring history are displayed in the building. You can see coins, ancient maps and nautical instruments, models of ships and boats. The museum is open every day, from April to October, from 10: 30 to 13: 00 and from 18: 30 to 21: 00. The admission ticket costs 3,00 €. More info on the official website. North of the port, the Archaeological Museum of Mykonos it is a must for those who do not want to renounce art during their holiday. The museum exhibit includes a vast number of vases, ranging from the prehistoric period to the late Hellenistic period. The exhibition includes funerary statues, stele, jewels and precious objects, clay figurines, from the 2nd century BC; ceramics dated from the 25th to the 1st century BC Also exhibited are idols and funerary reliefs from the Rínia necropolis. From Thursday to Sunday, 09: 00-22: 00. In winter, it is open from Tuesday to Sunday, from 09: 00 to 16: 00. The admission ticket costs 4,00 €. Info and updates available on the official website, from here. 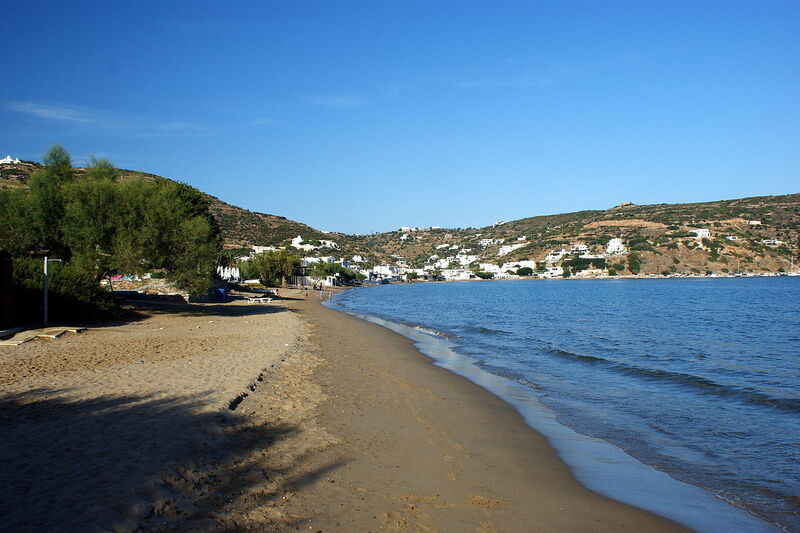 In importance, it is the second of the island, located about 8 kilometers from Mykonos Town. Rocky terrain, evocative chapels scattered between fields and hills, and small Cycladic-style houses characterize this picturesque village. The less touristic village of the island, is characterized by the presence of a couple of hotels and some studios. In the central square, do not miss to visit one of the small taverns where you can expect a quiet atmosphere and traditional cuisine. Not to be missed, in the village, the monastery of Panaghia Tourliani, dated 1542, and rebuilt about 2 centuries later. It stands on the main plateau of the island around which the settlement of Ano Mera was born. The beautiful courtyard, with flowers and greenery, is ideal to escape the chaos and bustle of Mykonos. Outside, there is a bell tower with stone decorations and a beautiful 17th century fountain. Open every day, from 09.00 to 12: 30, around and from 15.30 to 19.30. The timetable is subject to change. Beyond the Monastery, on the hill in front of the village, you will discover the ruins from Paleokastro, an ancient 14th century Venetian fortress. in the 12 century, and the remains of a Byzantine castle, as well as some tombs from the geometric period. 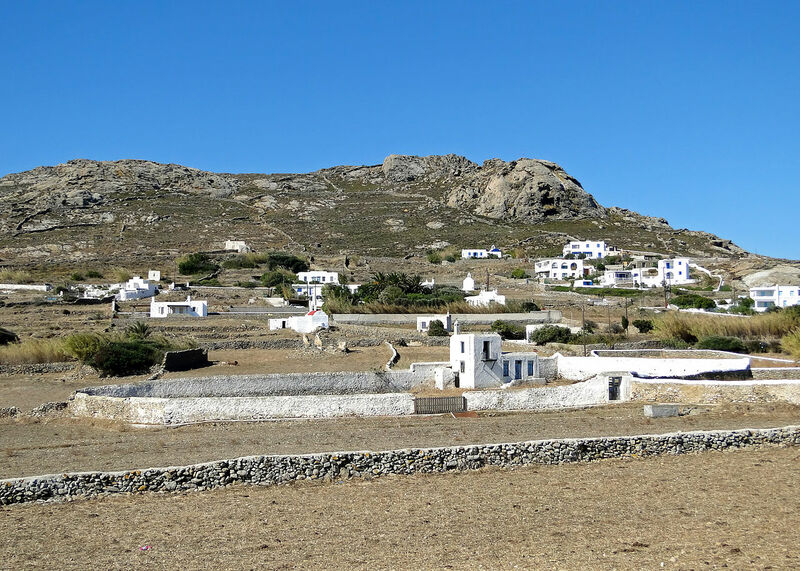 This small coastal village is located a couple of kilometers from Mykonos Town. Famous for the presence of the homonymous beach, well equipped, it represents an area in strong tourist growth. The main reason is due to the presence, in recent years, of the commercial port and the public port for yachts. Today, Tourlos is an interesting meeting point during Mykonos Summer. Here, in fact, cruise ships dock, and luxurious boats. Today, it hosts many entertainment opportunities for tourists; there are taverns and bars. Particularly nice at night, Tourlos is famous for its beautiful sunsets. The area, moreover, is famous thanks to the discovery of the famous icon of "Our Lady with Child Jesus". Tourlos can easily be reached by its own means and the bus leaving from Chora. A village that, despite a mass tourism development, still manages to maintain a typically rural appearance, with woods and farms. Perfect to be visited in the late afternoon, this ancient village is, without a doubt, one of the most scenic in Mykonos. Platys Gialos, however, is famous above all for its wonderful beaches, and is one of the most popular places on the South coast. The bay consists of three smaller beaches: that of Psara in the area to the right, with the rocky mass of Lazaros West; the one of Platys Gialos in the middle and finally the sandy bay of Agios Anna to the southeast; the surrounding hills protect the bay from strong southern winds. On the hill of Platys Gialos the remains of the ancient tower of the "Portes" are visible, an extraordinary monument, and a symbol of the coastal area. It is about 4 km from the Chora, e it can be reached by car and by bus. The nickname of Little Venice is well suited to this beautiful district, from the narrow streets, the ancient churches and the impressive windmills of the '500, in an incredibly scenic location. Little Venice is located right in the heart of Mykonos, with its characteristic houses, lapped by the seas, almost forming a labyrinth. The dwellings, in the 1700, belonged to merchants and captains and it is said that, at one time, they served to keep away the pirates who attacked the island. Today, however, many of these homes have been turned into restaurants, cafes, boutiques and art galleries. Here, do not miss to make an aperitif, in one of the most scenic and beloved of the island, in Little Venice, a palm of the hand from the sea. A show! Summer Mykonos can not be considered complete without having made a stop in Delos, a true gem of the Cyclades, not far from the island. Info on our special page, from this link. Good vacation and good summer Mykonos!